A virtual reality therapy system, the OmniVR® enables functional rehabilitation for aging adults and others with physical limitations. 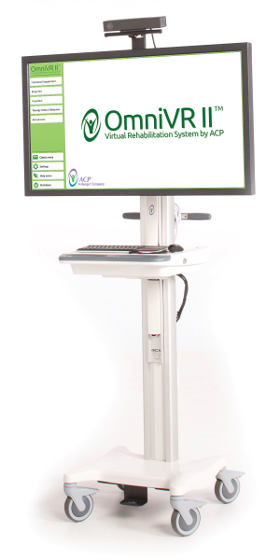 This easy-to-use system incorporates an advanced 3D camera and specialized computer to capture your patient’s movements and allows them to interact in a virtual world. OmniVR® helps to address patient’s cognitive impairment by incorporating activities that utilize memory and executive function. Virtual reality helps make therapy more fun and engaging for your patients and motivates them to exercise harder and longer while improving their functional outcomes. 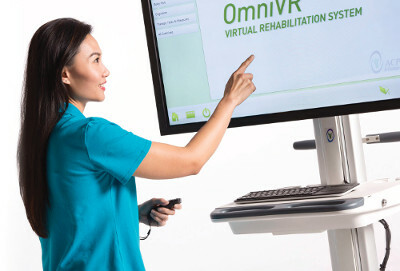 Our customizable evidence-based programs combine innovative technologies like the OmniVR® with customized clinical protocols and pathways, advanced therapist training and on-going support by ACP’s physical and occupational therapists to ensure you achieve better outcomes for your patients in the most efficient way.